If you’ve ever watched or attended any live music band performance with your favorite artists, then we don’t blame you for developing a new obsession about a set of strings wired to a figure 8-shaped board. Music means several things to different people but one thing all lovers of sound will agree to is that a guitar makes it all better. When you finally get you first guitar however, you’d be surprised at how quick your bubble of exhilaration can quickly burst as you realize that you’re a long distance on your journey from Newbie to Ed Sheeran. Although this sounds pretty much foolproof, the first step in your musical journey to expert guitarist is to actually buy a guitar of your own. This way, you can always get into your vibe at aby point in time. If you’re serious about learning to play, you can’t rely on Josh from down the block’s guitar or wait till every time your friends come over to practice. Factor in the size, the price, sound and quality before investing in anything. Since you’re probably not a guitar expert, it would be nice to talk to someone at the store or have an extra set of eyes from an expert player to help you pick out something that offers value no matter your budget. Once you’ve gotten yourself a sound piece of device that can play chords and notes accurately, the next step is to begin your training. One of the many ways you can learn how to play a guitar is to take face-to-face lessons with a teacher. This is one of the best ways to learn playing a guitar from a correctional and efficiency perspectives. If you opt for a one-on-one class, your teacher would be available to guide you on handling, notes, strings, chords and other valuable hacks. Individual face-to-face lessons means that you will be able to make mistakes and be corrected and you get to experience personalized guidance. Another method is to try a group learning with a face-to-face teacher in both small and large groups. All three methods have their pros and cons as face-to-face individual learning means you have a higher chance of mastering the guitar faster but could be hampered by cost and distance barrier. Group settings are more affordable but the fact that everyone isn’t learning at the same pace could be a drawback. Taking online lessons and courses in “Guitar-ing” is a fantastic way of bringing yourself up from newbie to amateur and semi-pro levels. Online lessons mean that you can structure classes to your convenience and you get to beat the barrier of distance and location by connecting with a wide array of talented instructors over the internet. Irrespective of your level, online lessons offer excellent platforms for learning and improving many aspects of your guitar playing. Since it is an interactive session and a visual one, you get to experience it as you would experience a face-to-face lesson. As of today, there are a couple of online platforms that teach guitar but we recommend GuitarTricks and JamPlay. Both have amazing benefits for aspiring guitarists at any level of play. GuitarTricks has a reputation as the leader in the online guitar course niche. The 1998-launched platform is the oldest online guitar tutor site with 32 professional instructors that are experts in guitaring. With over 11000 guitar lessons and more than 700 songs, it is easy to see why this site is renowned as the best. The website itself is easy to use and offers comprehensive video with super clear 4k technology. Jamplay is a worthy competitor to GuitarTricks for the throne as this platform houses an amazing 82 tutors that are true to their expertise. Jamplay is equally comprehensive and only falls short of the number of available online lessons. The experience on either of this site can be trusted to help you rack up the quality you need and fuel your path on your journey to mastering your guitar. Consider this an unpaid way to learn guitar. Although it can be uninteractive, heading to YouTube and fishing out some top guitar lesson videos can help you improve your play. Most of these videos are available as a playlist or in series and have been structured to teach crucial parts of guitar learning from stage to stage and some authors even offer the chance to interact via the comment area. If there’s one thing that applies to guitar learning and probably every other thing in the world, it’s the fact that practice makes perfect. Even when you have amassed and digested ample knowledge from your face-to-face trainer, YouTube or online lesson videos, the bulk of the work still lies with you. Apportion some hour(s) of your day dedicated to playing and practicing your skill on your guitar every day. Every day is quite important here because as a beginner, you want to be really frequent to get a perfect hang of the foundations. Know the time you feel best to play or the mood that always gets you ready to perform and tune into this moment. Asides practicing alone, you can hook up with a couple of newbies and pros in your neighborhood for an evening gig in your mom’s garage. This encourages you to exhibit, expose your mistakes and learn from others. Who knows, you all might just make the next boy band like One direction or Coldplay. 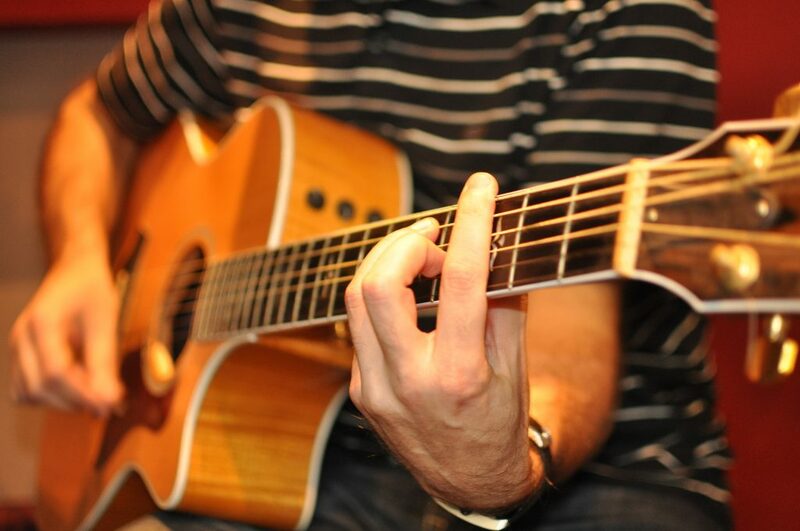 Playing your guitar to your favorite songs can be a great way to start learning the guitar. This will give you an edge in the sense that you already know the tones, chords and sounds that you are trying to reproduce. This can be an edge if you already have a comprehensive understanding of music, notes, sounds and tones. If you are already a songwriter, then you stand a better chance too as you already have an idea of how you want your songs to sound and you’d understand the feedback from the guitar against the notes you’re trying to play. Whether on mobile, desktop or online, there are a wide array of apps that can help you improve and perfect your guitar skills. There are many developed apps and games in the Android Play Store and iOS app store that can be downloaded to respective devices and used to improve guitar play. These games will also give you a chance to improve your rhythmic memory. Start from small challenges and improve them as you go. Learning how to play guitar can be a daunting task even when you’ve been in touch with music for some time. The first and most important tip is to ensure that you secure a good buy for your guitar and have the right type to play the right type of music you want. Face-to-face tutorials can offer fast and quick gains as nothing quite matches up to having a pro to guide you and correct your mistakes. Online courses and learning from platforms like Jamplay and GuitarTricks are affordable and effective too. Finally, patience, practice and persistence is the key to unlocking your potential and mastery of the strings. At the end of the road, we are all too sure that you’d love the experience!